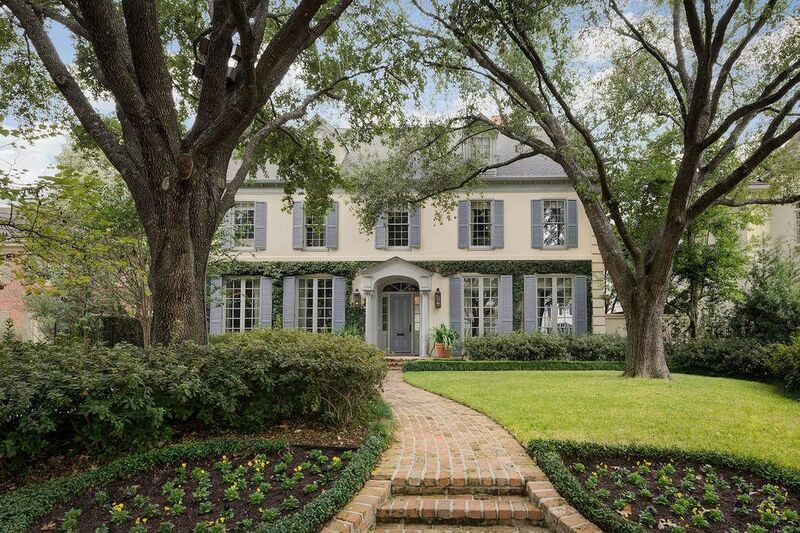 3244 Avalon Place, Houston, TX 77019 | Martha Turner Sotheby's International Realty, Inc.
[FRONT ELEVATION]A rare degree of livability framed by architectural sophistication and first-class design distinguishes this inviting, light-filled home nestled on a large wooded lot in River Oaks. 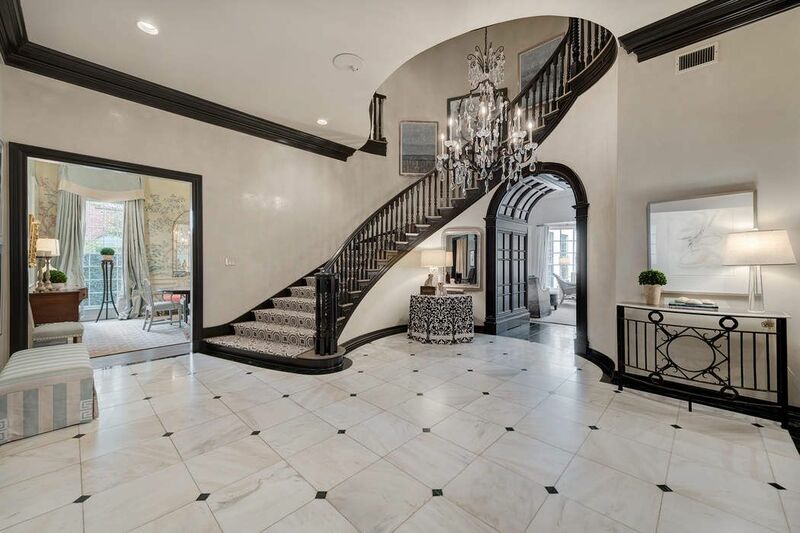 [FOYER]Flanked by the library and the living room, the foyer transitions into a wide central hall that travels past the dining room, formal powder room, and magnificent curving staircase to the rear of the house. 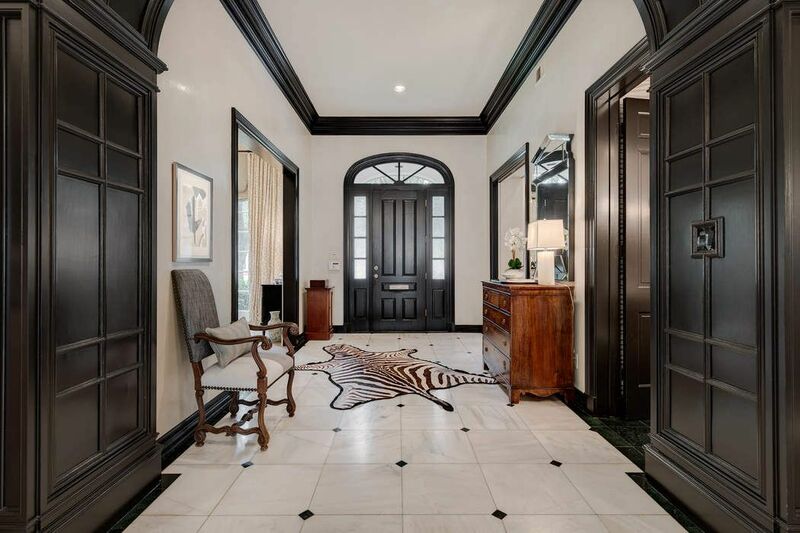 [FOYER]Stunning architectural elements include ceilings that soar up to 14 feet; luminous marble and white oak floors; high-gloss, Jacobean-inspired paneling. [FOYER]A view from the foyer into the light-filled dining room at left. 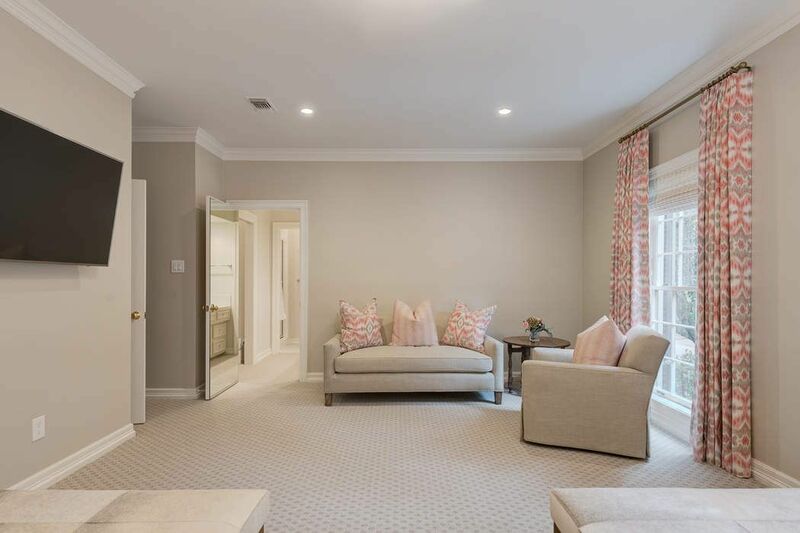 [LIVING ROOM 20x19]Flanks the foyer. 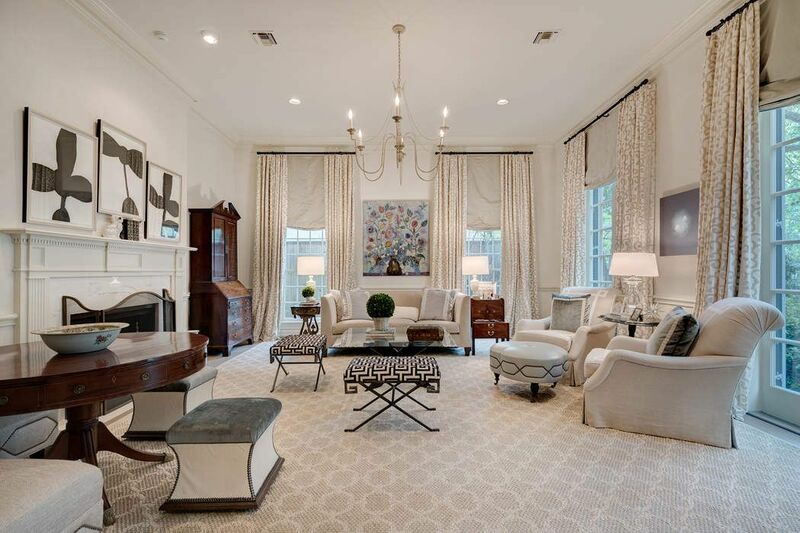 Appointments include a banded oak floor; lacquered paneling; a delicately carved fireplace mantel and marble surround; chair rail; and floor-to-ceiling windows. [LIVING ROOM]A second view of the living room reveals the fireplace and overmantel. [STUDY 18x13]Flanks the foyer opposite the living room. 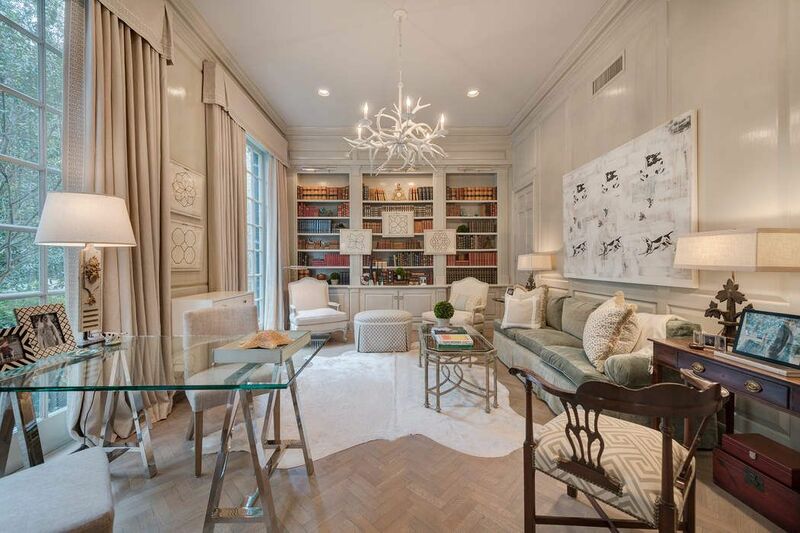 Amenities include a chevron-patterned oak floor; floor-to-ceiling book cabinets with library lighting; and floor-to-ceiling windows. [STUDY 18x13]A second view of the study travels across the foyer into the living room. 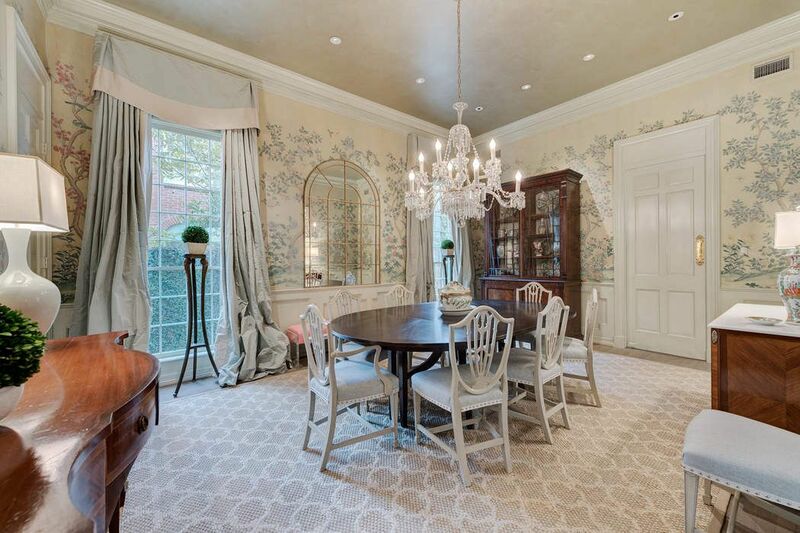 [DINING ROOM 18x14]Custom-designed avian wallpaper distinguishes this spacious, elegant dining room. 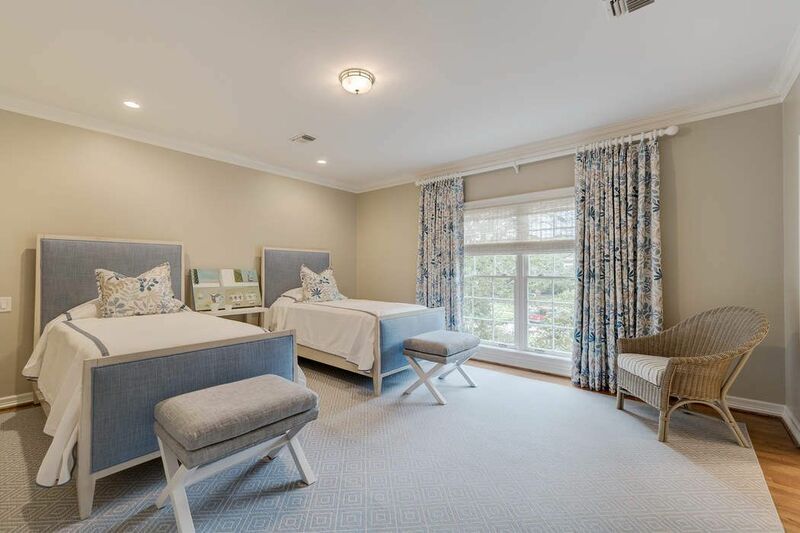 Note paneled wainscot and floor-to-ceiling windows. 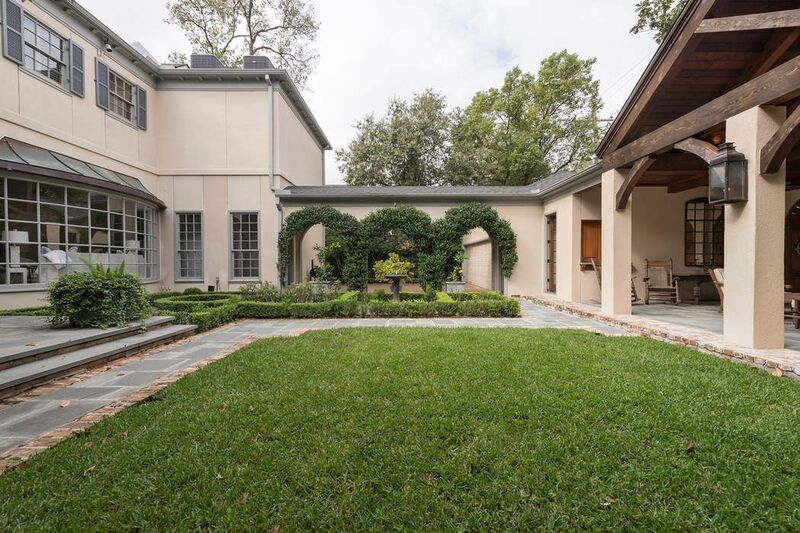 [DEN 26x16]Located at the rear of the house; overlooks the patios and gardens through Palladian-style French doors. 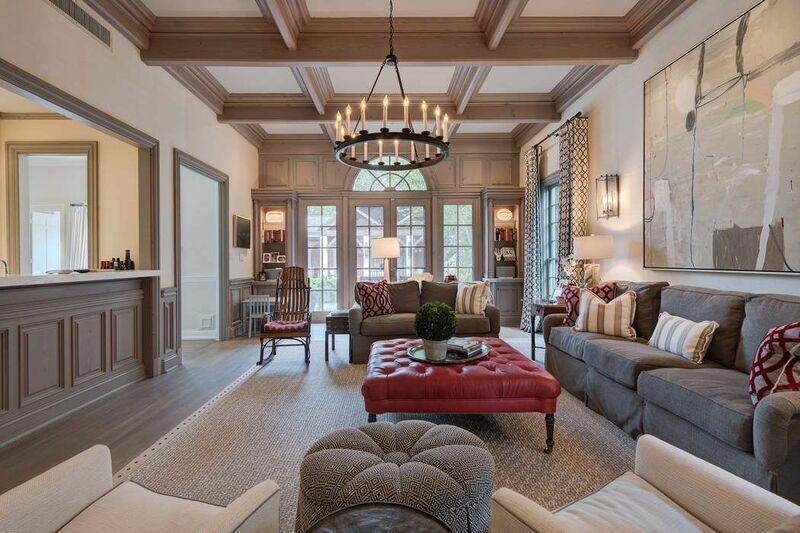 Coffered ceiling and oak floor. Fully-equipped, walk-in bar is shown at left. Cased opening leads to breakfast room and kitchen. [Bar]Conveniently located at nexus of den and breakfast room/ kitchen. 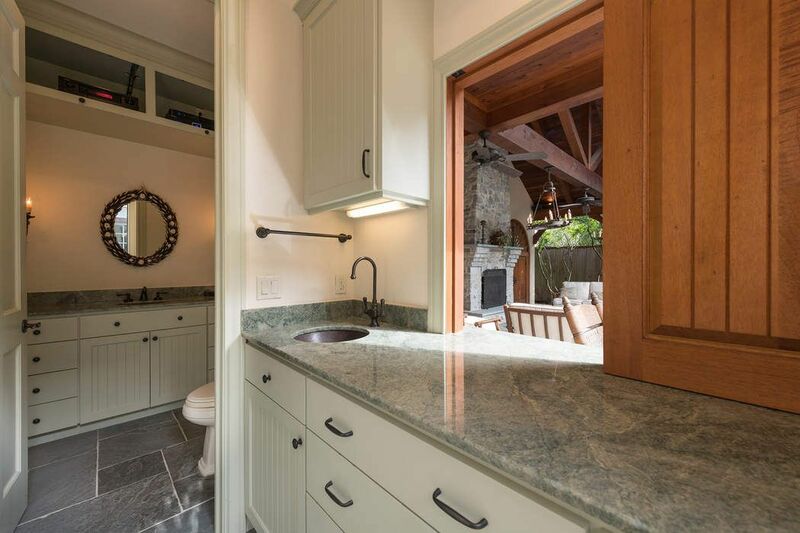 Note marble countertop, sink, and icemaker. 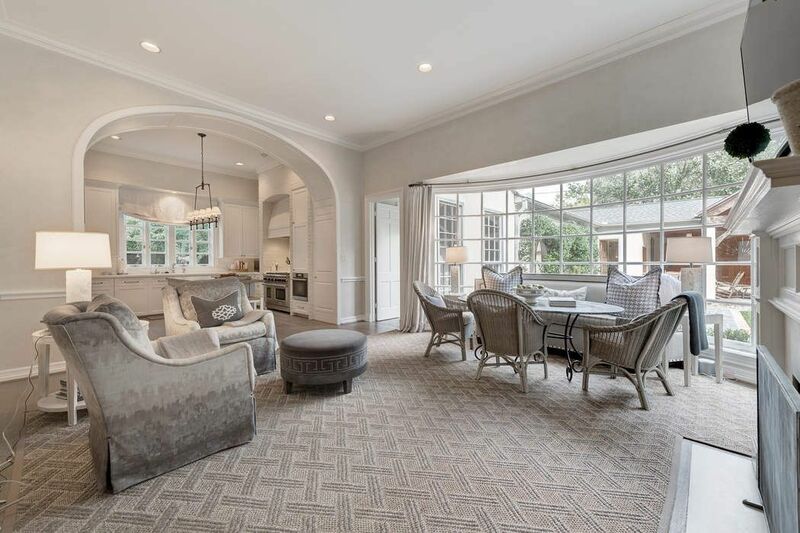 [BREAKFAST ROOM 18x17]Inviting, light-filled breakfast room overlooks the patios and gardens through a floor-to-ceiling bowed window. 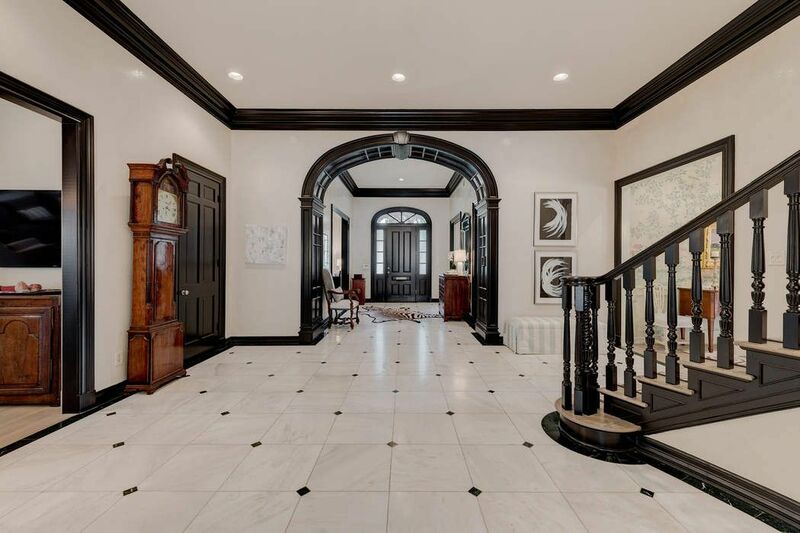 Note fireplace and wide arched opening into kitchen. [BREAKFAST ROOM] A reverse view of the breakfast room reveals the fireplace, deep cased opening into the central hall, and the opening into the den (rear). 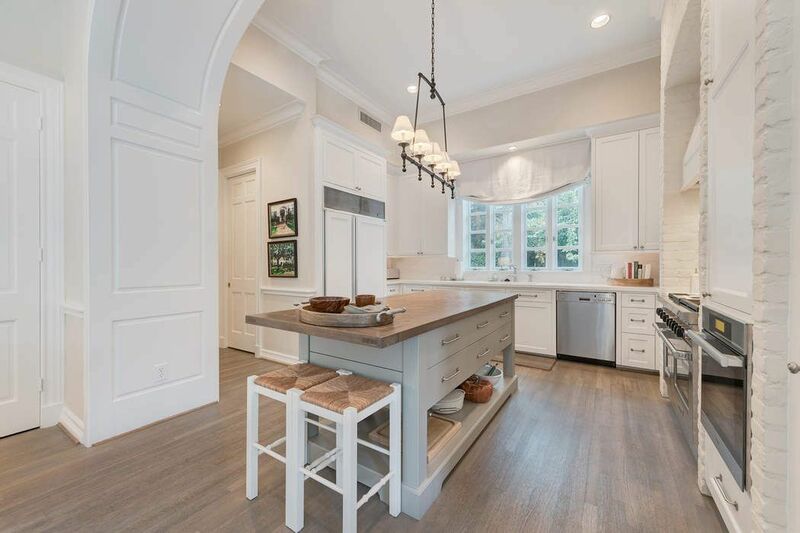 [KITCHEN 15x14]Light-filled kitchen has an oak floor and furniture-quality island and cabinets. 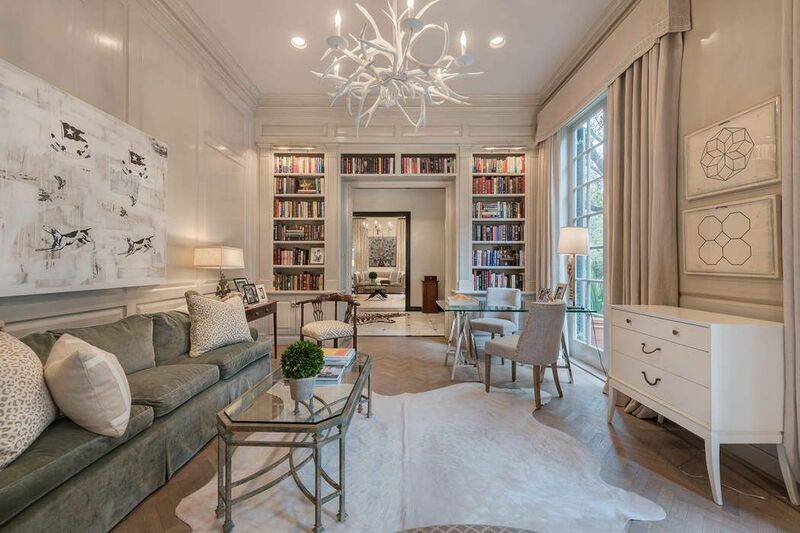 Note designer pendant lighting. 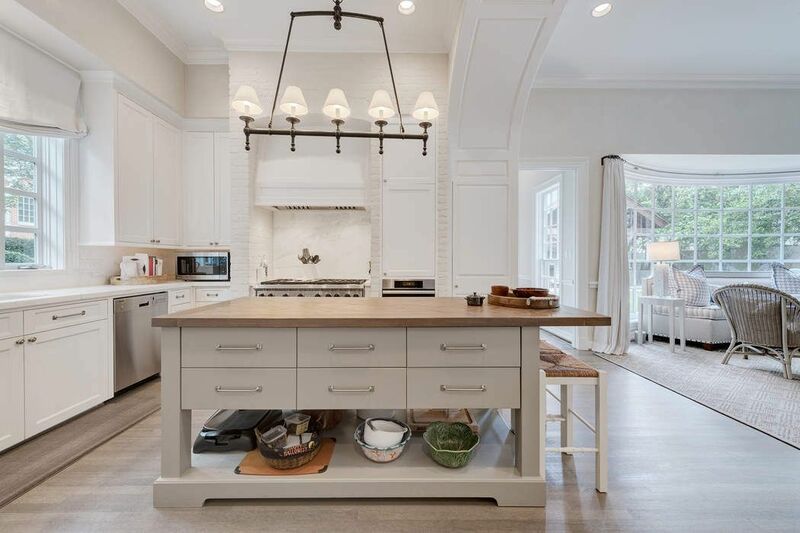 [KITCHEN]The island offers pull-up seating and open and drawer storage. 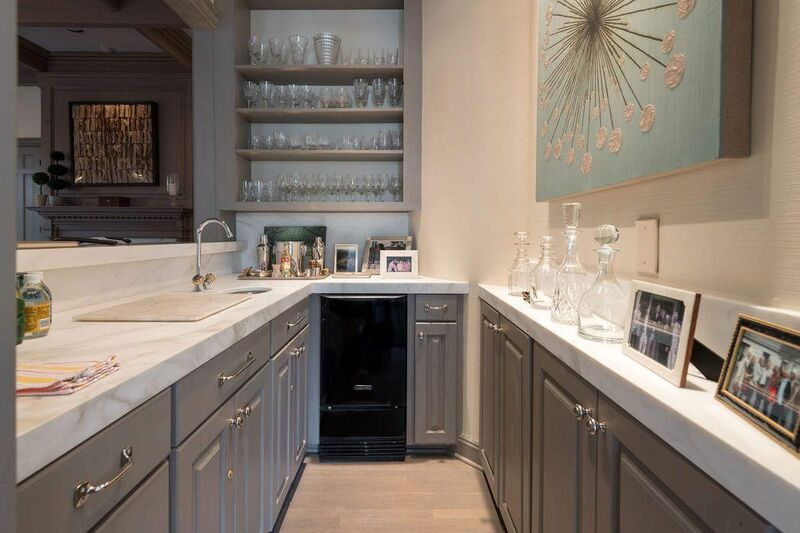 Appointments include a Wolf range and SubZero cabinet-front refrigerator/freezer. 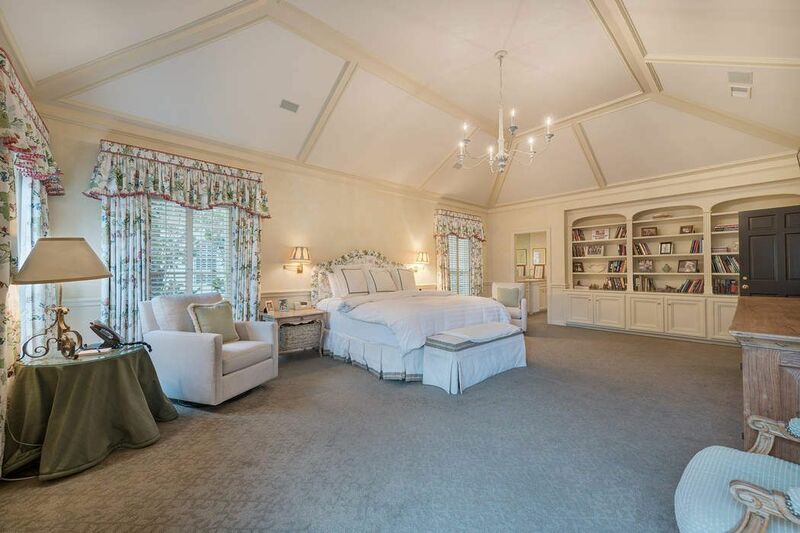 [MASTER BEDROOM 25x17]Serene master bedroom has designer carpet, a custom tray ceiling, and floor-to-ceiling book/display cabinets. [MASTER BEDROOM]Alternate view of the master bedroom reveals the entrances into the two master bathrooms. 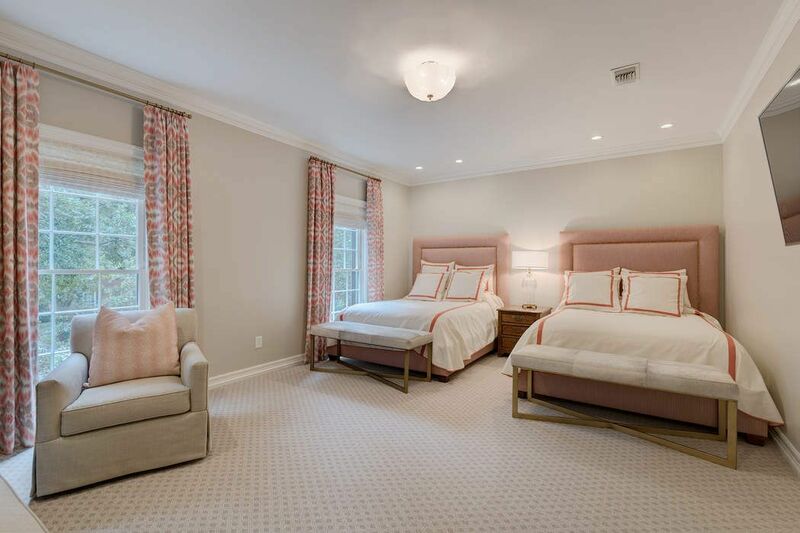 [BEDROOM 2 - 20x16]This en suite bedroom offers designer carpet, a custom-fitted walk-in closet, and white porcelain-tiled bathroom. [BEDROOM 2] Alternate view reveals the entry from the upstairs hall. 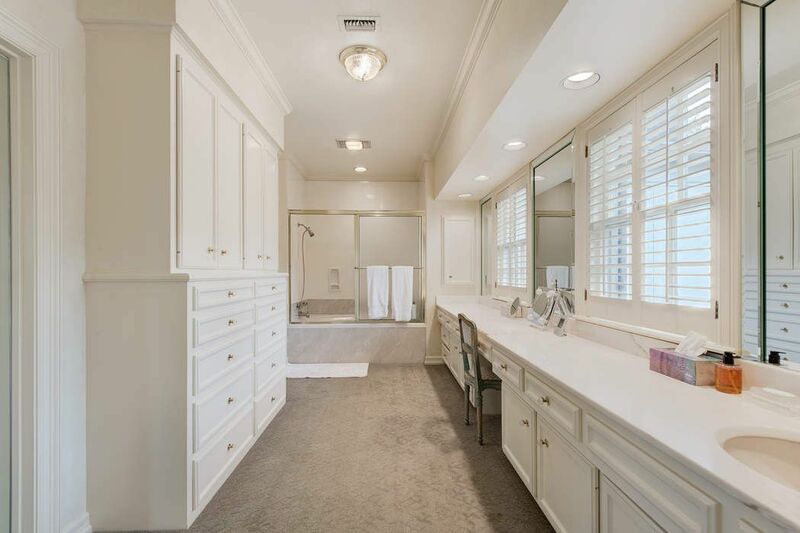 Door at center opens into the walk-in closet. 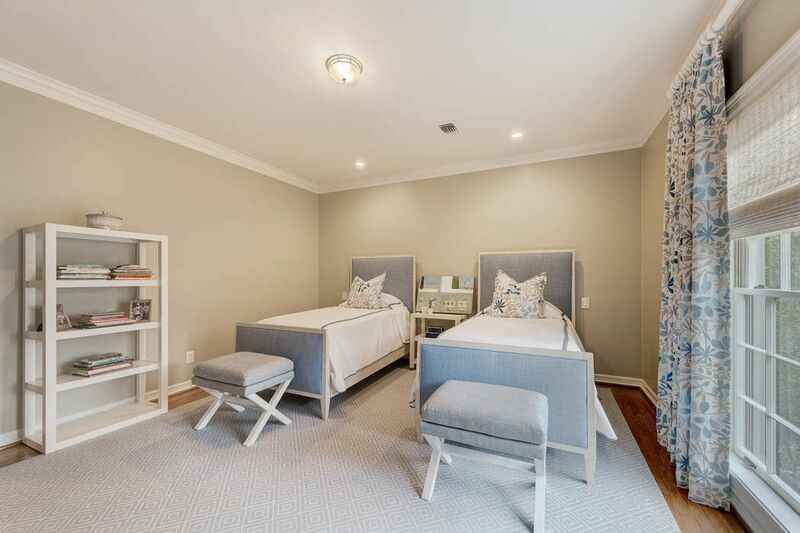 [BEDROOM 3 18x13]Spacious en suite bedroom has a walk-in closet, and easily accommodates a sitting area and two large beds. 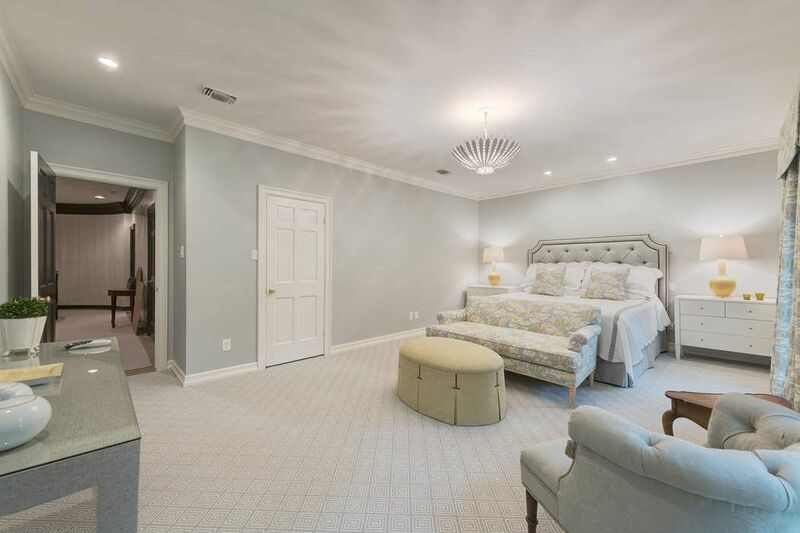 [BEDROOM 3]Alternate view reveals the entrance into this bedrooms attached bathroom. 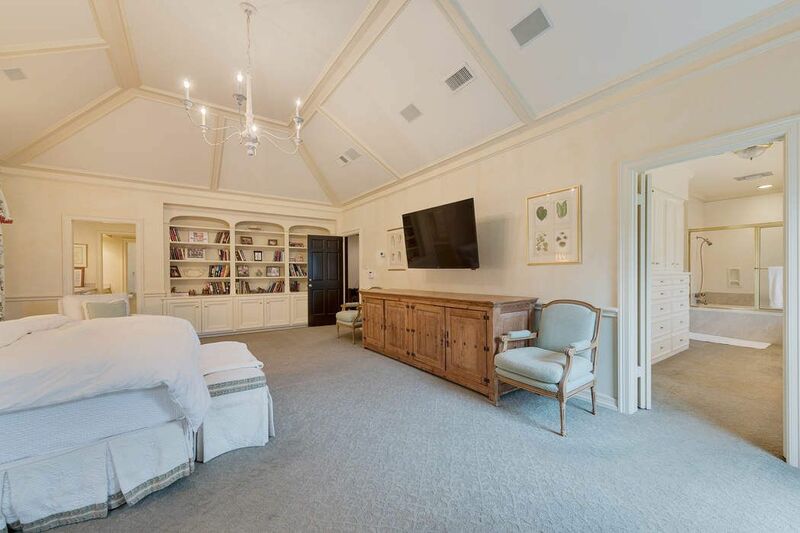 [BEDROOM 4 15x14]This en suite bedroom has a hardwood floor and walk-in closet. [BEDROOM 4]Alternate view of bedroom 4. [PAVILION/ TERRACES]A wide lawn separates the open terraces from the pavilion. [HALF-BATH AND BAR/ PAVILION]A closer view of the pavilion reveals the half bath and walk-in bar. Note window and serving counter. 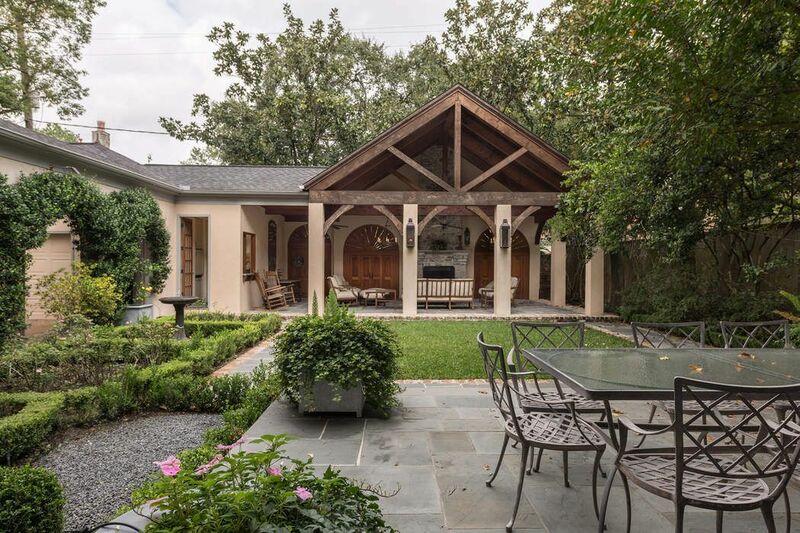 [PAVILION / OUTDOOR LIVING/ DINING]Note elaborate beam-truss ceiling, custom doors (left), and raised stone fireplace. 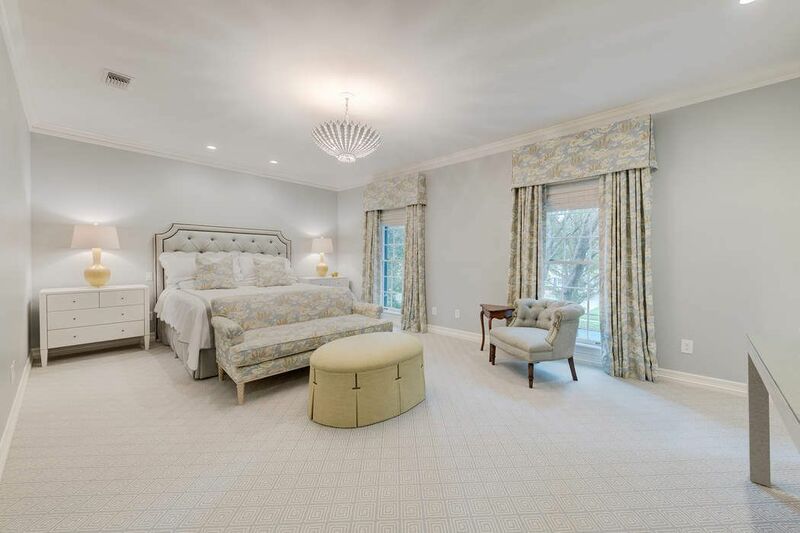 $3,999,000 5 Bedrooms6 Full / 1 Partial Baths6,669 sq. 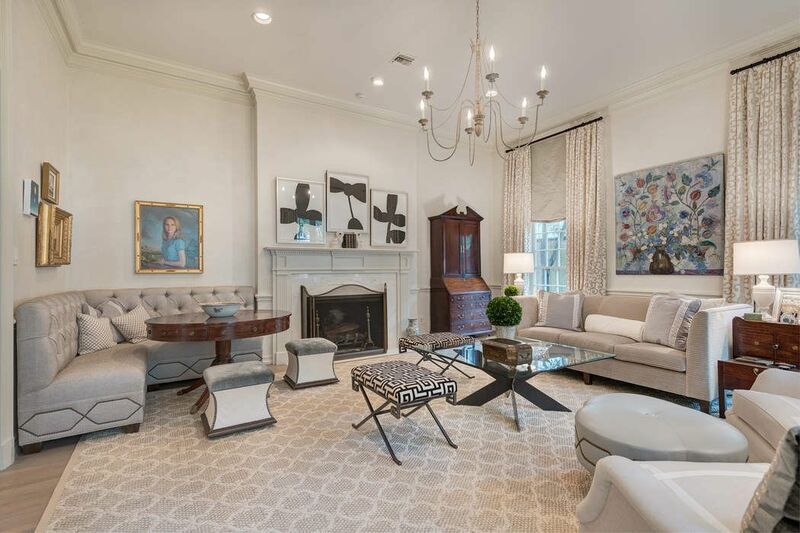 ft.
Inviting, yet sophisticated home distinguished by custom architecture and design. 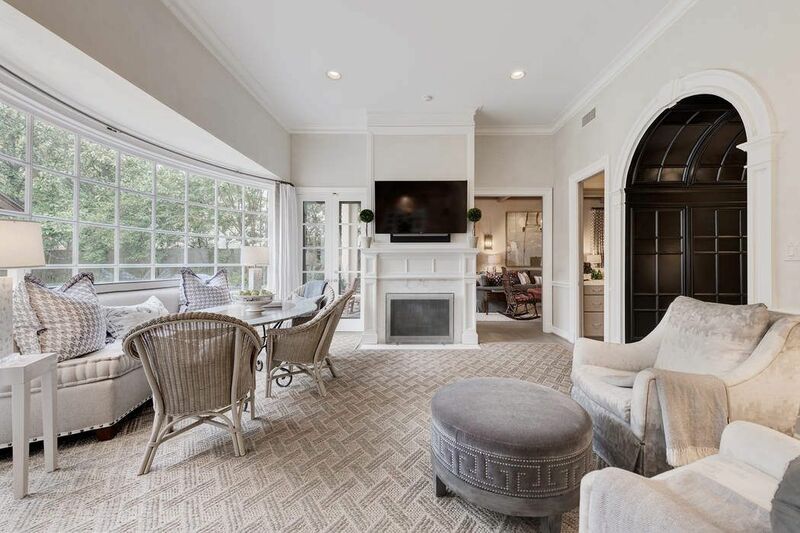 Open, expansive rooms with soaring ceilings transition seamlessly; banks of French doors and floor-to-ceiling windows; magnificent main staircase; elegant walk-in bar; exquisite fireplaces; marble, granite and quartzite surfaces; rich lacquered paneling and millwork; return staircase; elevator closet. 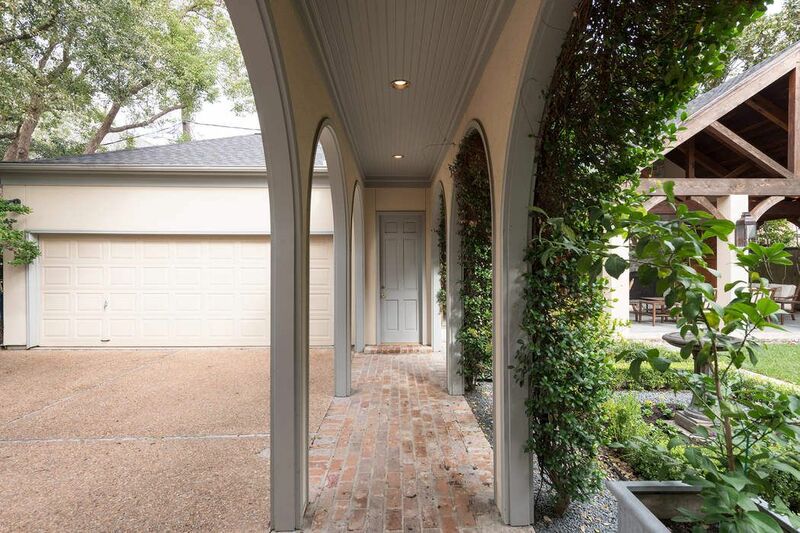 Exceptional outdoor living pavilion with summer kitchen, bar, seating areas; arched breezeway with brick hardscape.